The author is an amazing genius, the only one of his ilk to speak the truth. Or, he's a wingnut. You decide.An advanced humanoid civilization on Mars was destroyed by another advanced alien civilization, somewhere between a quarter and a half billion years ago. It was done by planet-busting sized nukes. We need to get some archaeologists there ASAP, learn what we can, and, oh, by the way, colonize the heck out of the place so we're not sitting ducks, should the bad guys revisit this part of space.If you can live through the (pretty whiny) career narrative, you can figure out that the author is a really smart physicist. If you can deal with the repetitive presentation of facts and pictures, which could have been presented in a book about a quarter the length of this one, you should come away with at least some questions, if not some ideas for some pretty cool SF stories. Oh, wait -- Martian Chronicles has already been written. Planets have already been destroyed in Star Wars.Still, you night find some of the speculation interesting. Or not. Ugh. "New proof of a nuclear catastrophe on Mars!" = Blah blah blah grad school Cold War ex-wife Albuquerque blah blah H-bomb blah blah plasma physics blah blah science as business blah blah academic conspiracies blah blah Face on Mars blah blah Carl Sagan blah blah hostility from colleagues blah blah Xenon isotopes blah blah frame angles blah blah spacefaring humanity blah blah cosmic Jesus.Here is the "proof" mustered by the author: there may have been water and bacterial life on Mars, a few blurry photos from space showed what looked likea face (at least until later, better pictures were taken), and the ratio of a particular xenon isotope in Martian rocks is similar to that found in nuke sites on Earth. Ergo a humanoid civilization on Mars was wiped out by a nuclear attack on the part of a second, technologically superior species. Seriously. The author finds this conclusive and continually describes it as the simplest hypothesis based on all the data!! If only I were kidding:Based on the widespread evidence for a geologically long period of Earthlike condition on Mars and evidence for life on Mars, the author concludes that the civilization was indigenous to Mars and perished during some catastrophe that collapsed Mars' climate system. Evidence that this catastrophe may have been a nuclear holocaust is also present, suggesting that the Mars civilization reached high levels of technology, though it's [sic] overall appearance is of a primitive bronze Age civilization. This latter conflict between evidence for nuclear weapon technology and yet primitive civilization of the other, means that hostile technological agencies extrinsic to Mars may be implicated in the Red Planet's demise. (p. 234) Full disclosure: I wasn't expecting to read a book that would actually convince me of a pretty out-there hypothesis, but I was at least hoping to be entertained by some interesting ideas. This book wasted dozens of pages on personal reminiscence that should have been kept personal, while taking serious pains to avoid making a substantial case. Or even a circumstantial case, frankly. By the end of the book (I am generous; most folks would've pre-decided this based on the mere fact of the book's existence) I determined that the author has some... issues. Very interesting scenario!Very technical in places for those not well versed in higher chemistry, but the message the author brings is easy to follow, and definitely awakens your thought processes! I have wondered why so much emphasis has been placed on Mars rather than a permanent presence on the moon, which would certainly be easier/cheaper. This author's well-researched data, as well as scientific, spiritual, and personal history provide a solid base from which he expounds his startling theory.I am so glad I bought this book! Must read on mars Well formed arguments for historical earth like environment on mars and disturbing evidence for its unnatural demise. Good images. Author succeeds in popular description of technical evidence for general consumption. Isotopic evidence compelling. Would have given five stars but found political theme a bit unnecessary though it does have implications for future disclosure. 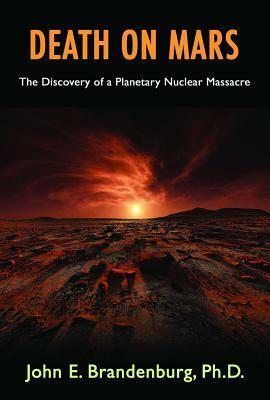 Intriguing hypothesisThe idea that Mars was destroyed by a nuclear weapon from outer space was startling, but if the author's science is right he seemed to have the proof. Since I'm not a scientist I wouldn't know. I think the book would have been better if it wasn't so redundant with scientific jargon. Thought-provokingI heard the author speak on late-night radio and had to read this book. I found the conclusions to be logical and well supported. I am contemplating reading "Cosmic Jesus. "We better get back to doing the important things as a nation. Interesting information and hypothesis, with nice photographs (b/w and colour). The book starts slow, but gets much better after the prologue and chapter one.